September 26, 2015, 6-9 pm. 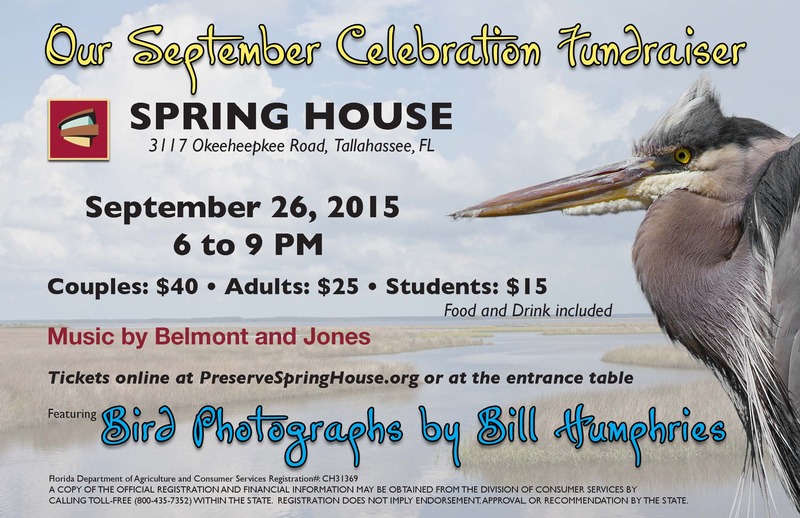 Come to the September Celebration Fundraiser held at Frank Lloyd Wright’s Spring House! Music, food, and refreshments will be served. Tickets are available online at www.preservespringhouse.org or at the door. Couples $40, Adults $25, Students $15. “Clifton”) and the family’s fondness for the Gulf coast and offshore islands. He completed the plans in 1952. After George Lewis’ death in 1996, Clifton and others formed Spring House Institute, Inc (SHI), a 501(c)(3) tax exempt not-for-profit organization, intending that SHI would buy the house for the home of Spring House Institute, serve as a conference center and host classes, musical events, poetry readings, community meetings, seminars, and other activities associated with the arts, the environment, science and social justice. Spring House is open every 2nd Sunday for public tours from 2 to 4 pm, $15 a person, children 12 and under are free. There is a regular work day every 4th Saturday from 9 to noon in the Spring and Summer and 1 to 4 pm in the Fall and Winter. Check PreserveSpringHouse.org for 4th Saturday seasonal change in time. Help preserve this important home for generations of public use!